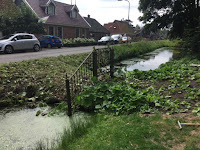 When you get the keys to a new house in the Netherlands, you have to undertake a walk around accompanied by the departing owner and the estate agent to ensure that nothing has changed since you last saw it in the offer stages. You troop ceremonially to the water meter, the electricity and the gas meter to take note of the readings and the estate agent annotates it on a pre-prepared form and asks you both to sign to agree that the readings are correct. Presumably, this is normally quite an ordinary process - and it is eminently sensible to ensure no unhappiness later on. As you can imagine, it wasn't quite that simple here! The mains water stopcock and meter are in a concrete bunker out in the front garden. It's buried deep in a mass of Butterbur (petasites hybridus) which was a small and delicate plant when I first made the offer. By the time all the contracts and legalities were ready to close it had swollen to enormous proportions - a lot like Tolkein's innkeeper in Bree. It was so large that the agent & W had to dive in and hunt for the bunker like Victorian explorers looking for the source of the Nile . With such thick foliage so close to the edge of the canal, the leaves acted as perfect hiding places for swarms of mosquitos all starving during the sunny daylight hours. I react horribly to mosquito bites so clearing this out as quickly as possible rocketed up to the top of the to-do list. The garden has been essentially untouched for quite a few years - my best guess is that it's been at least 6-8 years since anyone tried to challenge the Butterbur in it's encroaching growth or the bountiful swathes of nettles that have spread throughout the entire garden area. Our first plan was to cut back the top level , dig out major corms and see if that would hamper the growth of the (at that time) unknown plant. I duly assigned A & M to doing getting out there with the Stihl Kombisystem brush cutter and a fork, shovel and wheelbarrow. 4 hours later, the area cleared was approaching one foot square and the gardening army was exhausted. There had to be another way! That said, plant identification had happened, and I was rapidly realising that I may have a larger problem on my hands than I originally thought. I really didn't want to start using chemicals in my garden, but faced with this challenge, and a very limited time window with large amounts of human resources we finally opted to strim everything back to ground level, wait for the first regrowths and to spray with weedkiller. The picture above is what it looked like 3 weeks after the spraying : virtually no dieback and ever expanding leaves. It had to be the good oldfashioned 'dig it out' way. 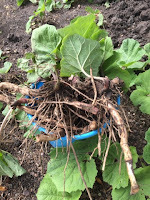 This plant has the hugest roots - and sends thick meaty runners across the ground and long tendrils deep into the soil. We've been through 4 forks - all with bent tines, already. In desperation, I imported a Spear & Jackson Neverbend Professional fork with a 10 year from the UK in the hope that it might last a little longer than local Dutch brands - it lasted about a week longer, and now I'm looking forwards to seeing how well the guarantee is upheld. 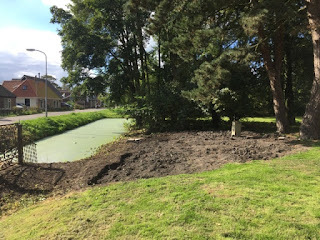 After two months of digging we have managed to clear back as much as we dare, without destabilising the banks of the canal, but already the damn thing is growing back despite our best efforts. We went nearly a foot deep and it's still rooting! We will keep digging through the winter, and hopefully in the spring we will be able to re-grass the whole area. It's not quite the Hobbiton Green I'm dreaming of yet - but soon, soon!